Jan 29, 2018: India’s external sector continued to be resilient and strong in 2017-18, as observed in the Economic Survey 2017-18 which was tabled in Parliament today by the Union Finance & Corporate Affairs, Shri Arun Jaitley. The global economy is gathering pace and is expected to accelerate from 3.2 percent in 2016 to 3.6 percent in 2017 and 3.7 percent in 2018 which reflects an upward revision of the earlier projections by the International Monetary Fund (IMF). India’s balance of payments situation, which has been benign and comfortable since 2013-14, continued to be so in the first half of 2017-18, despite some rise in the Current Account Deficit (CAD) in the first quarter, with a relatively lower CAD in the second quarter. India’s CAD stood at US$7.2 billion (1.2 percent of GDP) in Q2 of 2017-18, narrowing sharply from US$ 15.0 billion (2.5 percent of GDP) in the preceding quarter. India’s trade deficit (on custom basis) which had registered continuous decline since 2014-15, widened to US$ 74.5 billion in HI of 2017-18 from US$ 43.4 billion in HI of 2016-17. India’s trade deficit was US$ 108.5 billion in 2016-17, with reduction in both POL deficit and non- POL deficit. In 2017-18 (April-December) trade deficit (on custom basis) shot up by 46.4 percent to US$ 114.9 billion with POL deficit growing by 27.4 percent and non-POL deficit by 65.0 per cent. 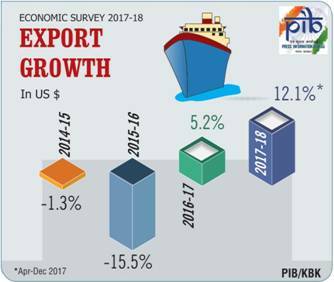 Export growth in 2016-17 was fairly broad based with positive growth in major categories except textiles & allied products and leather and leather manufactures. In 2017-18 (April-November) among the major sectors, there was good export growth in engineering goods and petroleum crude and products, moderate growth in chemicals & related products, and textiles & allied products; but negative growth in gems and jewellery. The prospects for India’s External Sector in this and coming year look bright with world trade projected to grow at 4.2 percent and 4 percent in 2017 and 2018 respectively from 2.4 percent in 2016; trade of major partner countries improving and above all India’s export growth also picking up. The downside risks lie in the rise in oil prices. However, this could also lead to higher inflow of remittances which have started picking up. The supportive policies like GST, logistics and trade facilitation policies of the government could help further.